Would you like a call when the space station orbits over your backyard? Sign up for Spaceweather PHONE. AURORA WATCH: A solar wind stream is heading for Earth and it could cause a geomagnetic storm when it arrives on April 21st or 22nd. Sky watchers from Scandinavia to Alaska should be alert for auroras. These images will be displayed on big screens at science centers around the USA (list) and posted on the internet. 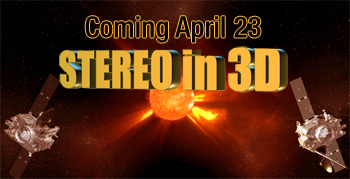 Get ready this weekend by buying or building some 3D glasses--and stay tuned for Monday! Kim L. Graham took this picture on April 19th from Madison Lake, Ohio. 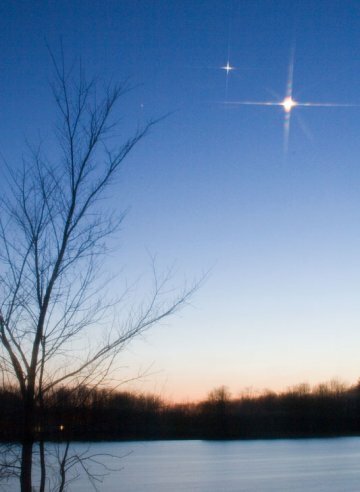 She used a SpectralStar filter to give the Moon and Venus added flourish. Later tonight when the sky fades to black and the stars come out, watch the crescent Moon glide by Elnath, a dying star in Taurus: sky map. more images: from Pete Lawrence of Selsey, West Sussex, UK; from Babak A. Tafreshi near Tehran, Iran; from Dan Bush of Albany, Missouri; from Szymon Kozlowski at the Jodrell Bank Observatory in Cheshire, UK; from Guillaume Bertrand of Saint Laurent sur Sèvre, France; from Maximilian Teodorescu of Magurele, Romania; from Ronan Newman at the Turlough Round Tower, an 800-year-old Celtic monastery; from Mohammad Taher Pilevar of Hamedan, Iran.